Over the years, I’ve made more batches of pancakes than I can remember. From pumpkin to blueberry to apple, fluffy pancakes are always greeted with a smile in my household. Now, thanks to these moist and mouthwatering Barely Banana Protein Pancakes (with 4 Little Ingredients), I have a new recipe to add to the mix. 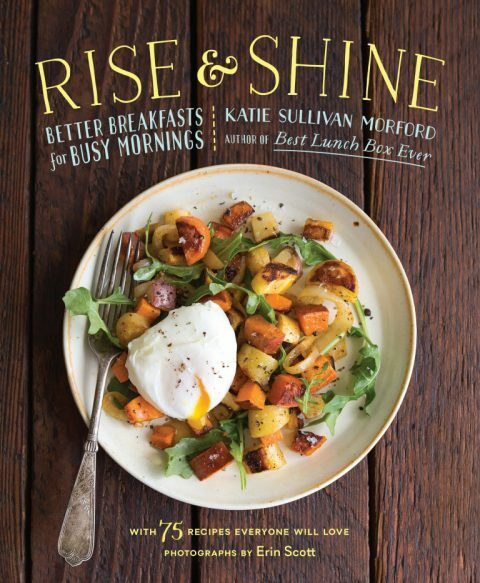 This recipe comes courtesy of Katie Sullivan Morford, author of the new cookbook, Rise & Shine: Better Breakfasts for Busy Mornings (Roost Books, 2016). 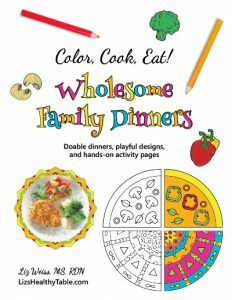 The book is filled with recipes and tips for boosting the flavor, variety, and nutrition of your family’s morning meal. The last thing any of us needs is a breakfast recipe that’s fussy. But after a good night’s sleep, the first thing we all need is nourishment, especially protein. Eating breakfast is good for your body weight, your grades (if you’re in school! ), and certainly your mood. To the rescue is Katie’s new book, filled with 75 easy and interesting recipes. 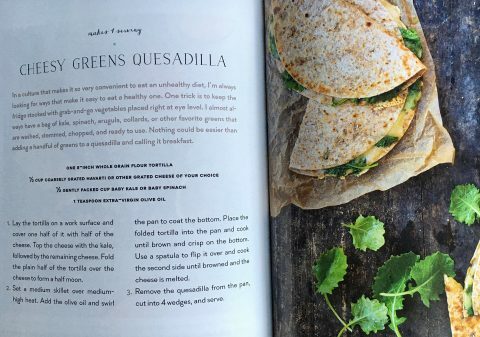 I love the idea of adding veggies to breakfast and turning quesadillas into something kids would want to devour in the morning. And speaking of green, Katie’s green smoothie gets its sweetness naturally from pineapple, banana, and an orange, and we agree that even our kids would love it too. When I tried Katie’s banana pancakes, I topped them with maple syrup, but you can certainly use homemade jam instead. Put the eggs, oats, cottage cheese, and banana into a blender. Blend until the oats are pulverized, the cottage cheese is blended, and the batter is smooth. Set a skillet over medium heat. Add about a teaspoon of oil and swirl the pan to coat the bottom. Pour about 1 tablespoon of batter into the pan for each pancake, making as many as will fit without crowding. Cook until bubbles appear across the surface and the bottom is deeply brown. Use a spatula to flip the pancake and cook until firm to the touch, another 1 to 2 minutes. Serve hot out of the pan with a thin layer of jam. I would love to make healthier breakfast and I really need a new blender!! I would love to win so I can make delicious smoothies for my family. Our favorite breakfast is a ham and cheese quiche. I want to win because I have always wanted one of these blenders.We make egg white omelets with green onions and bellpeppers. I’d like to win because I want my children to see that eating healthy doesn’t need to be hard! I hope they will continue to use the skills I’ve given them and continue when they’re on their own. Breakfast food is my favorite, both to cook and to eat! I am always trying to get my husband and daughter to eat breakfast and get something.in their bellies to start the day. A favorite breakfast thing to cook when I have time and one of their favorite things to eat is cinnamon applesauce pancakes. The ninja would be perfect for us as we are often too rushed for a sit down breakfast, we make breakfast smoothies almost every day. We have the same thing every morning for breakfast. Eggs, a banana, and toast. I need help!! I would like to win so I can cook more recipes for my family. We like french toast for breakfast. I would love to win because I enjoy cooking healthy meals for my family, and I am always looking for new recipes. Honestly, my kids deserve my giving them something much better than a piggle stick or a breakfast pocket…. . I would like to win because my family loves smoothies, and my blender is the worst. Ive been wanting both of these great items to cook healthy breakfasts for my family. Breakfast is often the only meal of the day my husband and I can sit down to enjoy together. Would love to amp them up with new recipes and a shiny new blender! Thanks! Following on both Facebook and Twitter. Follow on Pinterest as well! I would love a new blender! We enjoy your Greek yogurt pancakes and mini chocolate chip banana muffins. I also follow you on Pinterest. Keep up the great work! My family and I are trying to start our days out healthier. We’re really wanting to have smoothies more often, and it would help if we had a new blender! I would love a great blender and new ideas for healthy, non processed breakfasts for my children. Whole wheat blueberry pancakes are a favorite in my house. We love peanut butter smoothies! My husband just built a learning tower for my daughter, and she is starting to love watching/helping us cook, I would love to win so we can keep cooking up great stuff together! I’d like to win because we are in a major breakfast rut! I have another child starting school next year and I need healthy ideas! Our favorite breakfast recipe is strawberry banana smoothies. I’m always running of ideas of what to do for breakfast, this cookbook is just what I need. The blender would be a life saver. Thanks for the chance! I would love to win the book because breakfast food is my favorite and I am always looking for new healthy recipes to try. Also, I have been wanting the blender for awhile but it is too pricey. Our favorite breakfast lately has been egg and vegetable burritos with a side of fruit and coffee. I would love to win because I need some ideas and inspiration to make healthier meals for my family. I would love the cookbook for more breakfast ideas and the blender to make them! 🙂 Thanks for the chance! I follow on pinterest (hippiehut). And I shared on twitter and Facebook. We love skillet potatoes with lots of veggies and a fruit smoothie on the side! I heard the episode. Anxious to read the cookbook and find new ideas for breakfast. Seems to be the meal that my kids are the most picky. The blender would be awesome. I’ve never incorporated smoothies into our diet! 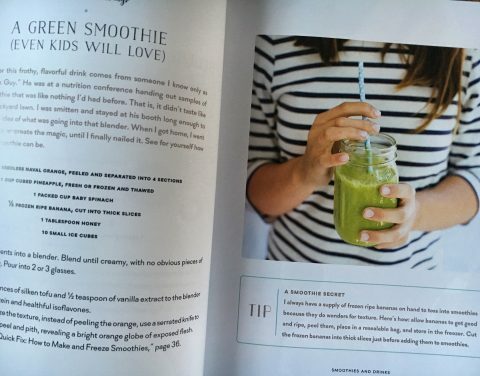 Would love to win the book because I make the same smoothie almost daily…definitely could use some recipe inspiration! Would love to win the Ninja because I recently wore out our old one and haven’t had the $ to replace it yet. I follow The Meal Makeover Moms on Facebook! Follow The Meal Makeover Moms on Pinterest! For some reason, breakfast for me is an issue. The recipes I love, prepare and prefer to share are all loaded with fat and serious carbs (think bacon, eggs, bacon, bread, bacon, breakfast casseroles with lots of cheese, and did I mention bacon?). 2017 has to be different and this looks like an excellent start. Merry Christmas to you and your family! I love cookbooks and my blender is shot! My favorite family breakfast is baked blueberry french toast. Breakfast is my favorite meal, we have brinner (breakfast for dinner) once a week! 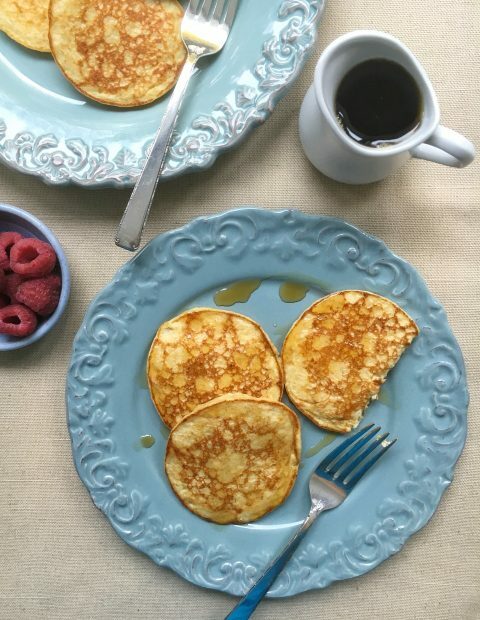 Our favorite family recipe is my buttermilk pancakes. I use a combination of white and wheat flours along with browning the butter. Both of those items add nice flavor and texture to the cakes. I shared on Twitter: https://twitter.com/FireRunner2379/status/810600917619896321. I would love to win because I would make great use of the blender and I personally love breakfast food and am always up for new, easy to make dishes to serve for breakfast or really any time of the day. We (read: my husband) have a hard time thinking of good healthy weekend breakfasts that are fast. We (he) needs help. And I’ve dreamed of a blender that breaks down kale all of the way. Not a fan of kale bits in our smoothies. I am always looking for new and healthy recipes for my family and this book and blender combined would help me to accomplish new healthy meal ideas. I’d love to win the blender to gift it to my son, as I already have a VitaMix. My favorite breakfast is smashed avocado on toast with a poached egg on top, accompanied by a nutritious smoothie. I would love a new blender and new recipes to try for healthy breakfasts! I love making smoothies but my current blender just can’t cut it! A new blender would help me out so much! I was just talking with my son this morning about how we could incorporate more fruits and vegetables into his diet and had the idea to start making smoothies for breakfast. This would be ideal as we don’t have a blender. Getting kids involved in the cooking process makes them more willing to try new things and the new recipes will help to get a healthy and delicious start to our day. Thanks!! My mom would love a blender! I’d love to win this beautiful cookbook and blender. I try to prepare healthy meals everyday and this cookbook would help me along the way. I also am in need of a new blender for lots of green smoothies! I love the sausage egg casserole my mom makes on Christmas Morning but our favorite simple weekend breakfast is eggs, toast and bacon. Yummy! As a registered dietitian, this book and blender would definitely be focal points in my cooking and nutrition education classes!! I would love to make pancakes for my family and I think that they would like smoothies. I would love to have that blender because I want to start making my VERY picky eaters some smoothies! I’d like the book because I’m tired of thinking of new breakfast recipes and would like to have more variety for that meal. Our family’s favorite breakfast meal is beignets. Not nutritious but oh so yummy! I would like my kids to eat something other than cereal for breakfast. Would love to try some of the warm breakfast ideas! Cold smoothies don’t cut it in our Alaskan winters! I would love to make our favorite blender pancakes with a new blender! Pancakes looks good. I’ll have to try them soon. My son is into sports, you name he is or have played. A new Ninja blender would be so helpful providing healthy protein packed smoothies for his breakfast on school days. He travels on public transportation from San Leandro, Ca to San Francisco, Ca daily. Another way to add nutrients to our diets. I LOVE breakfast. One of our family’s favorite recipes is frittatas. My family needs to lose weight and eat healthier. This would be perfect to help us get started. Frankly, I’m pooped trying to make sure my kids eat a healthy breakfast! It makes me too tired to eat! A new cookbook and blender would be thrilling, especially if they’ll drink the smoothie! Would love the blender for smoothies! I would love to use this Ninja blender to provide nutritious smoothies for my daughter who is always on the go. My hubby and I love to make a sunny side up egg a inside of half an avocado. We top it with a little plain Greek yogurt and some salsa. I am always looking for new nutritious breakfast ideas. I would lhave ve to win the blender to try to do my own nut butters. I would love to win your cookbook!!! It looks healthy and easy!! What a positive way to start 2017. I really need simple breakfast recipes for the 2 kids and husband. I always look for quick healthy recipes. I enjoy listening to your podcast and have looked into your website for recipes. My kids enjoy cooking and baking with me. I also love kitchen gadgets that help me make things from scratch. If I could stop buying processed food, I would. If gadgets help me make things faster even better. I followed your pinterest from a long time ago. I would love to win this book and blender because my goal for 2017 is to eat more fresh veggies and I would love to make more smoothies and soups! I could easily do it with this blender! Shared Public on my Facebook! My kids and I are in a breakfast rut. I would love to win the cookbook to gain new nutritious ideas to start our days of on the right foot. We’d love to make more nutrient-packed smoothies with the Ninja blender! Hi! 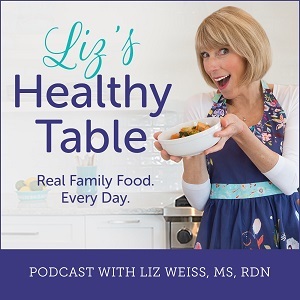 I have 3 kids and a couple of them are fairly picky and would love to get new ideas on how to make kid friendly meals that are healthy at the same time. I’m not a great cook so a recipe book would be very helpful Thank you!!! I would love to win this cookbook as I need new “entry level” ideas for my picky little eaters! I’ve heard great things about the Ninja so that would be an added bonus to winning the book! I was introduced to LT360 eleven months ago. It is a healthy way to lose weight and maintain it cellarly. Your recipes are very helpful, and owning a Ninja blender would be a dream come true for me! Thank you for giving someone this exceptional gift!! I would like to win because I love breakfast and cookbooks. I need a new cookbook especially one with healthy breakfast ideas. My husband and I are trying to move toward healthier cooking and eating as we are getting older. We need ideas and recipes to help make these kinds of changes. This would be amazing to win for a lot of reasons, but mostly smoothies. 🙂 Our favorite breakfast is pancakes and waffles. My favorite family breakfast recipe is hotdog gravy over pancakes. I’d love to win the breakfast book to increase my repetrior of breakfast ideas! I love breakfast, but getting the family to eat is a challenge! Plus…..I’ve ALWAYS wanted a Ninja! I would like to win to learn more healthy ways to eat! I love breakfast but have a hard time coming up with quick easy ideas, this would be a great help! Breakfast is my family’s one meal we can always have together, because of my husbands late-work schedule. Weekdays we are up at 6am, while weekends are our lazier later breakfast time together. This Ninja blender would help get breakfast on the table in a healthy AND fast way with protein-packed smoothies on school mornings but also would work wonders making things like these DELICIOUS sounding pancakes on the weekends. Katie’s recipes look mouth watering and Erin’s photography for the book, is gorgeous! And my blender motor gave out two weeks ago, so winning this amazing tool would be perfect timing . I would love to start making healthy food for my family. I would love love to win this cookbook and blender because I’m pregnant with our first child and feel these items will help us raise a hopefully not too picky eater. Thank you and I love the podcast! Since my favorite breakfast to make is scones, perhaps I am in need a new cookbook with healthier recipes. And a new blender would be nice too. I started following on Pinterest. I would like to have a giveaway for one of our independent retailers to win that they could give away to one of their customers as part of the Eat Right for Life program. My breakfasts are getting boring and need healthy alternatives that are packed in protein and not a lot of sugars. Your recipes never disappoint! I’d love to win! My favorite breakfast recipe (at the moment) happens to be from this very cookbook. Sally at Real Mom Nutrition posted the Dark Chocolate Raspberry Muesli recipe on her blog back in September and I fell in love with it! 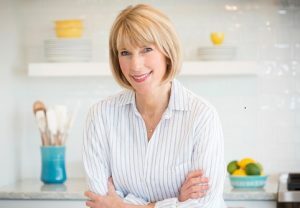 I follow The Meal Makeover Moms on Twitter! I am following you on Twitter. Thanks for all of your good ideas. I follow The Meal Makeover Moms on Pinterest! My family enjoys making breakfast egg cups because my little ones love helping mixing in different veggie combos and herbs. They can’t go wrong and they are easy to eat and take along on the road. I would love to win the blender and cookbook. I have 5 daughters and we love to be in the kitchen together trying new recipes and cooking techniques. Our fondest family memories are in the kitchen either around the counter or around the table. Food and family, nothing is better. I’m following Meal Makeover Moms on Pinterest. Happily just shared a tweet about the giveaway! I shared with friends in Facebook! Posted on Facebook and liked your page. Would love to win to change up my boring breakfast routine…and also to make healthy smoothies. I’d love to get this cookbook because it looks really family-friendly. 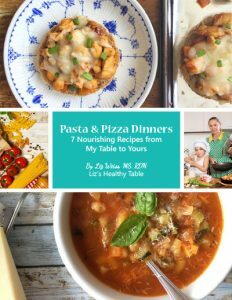 My kids love to make things in the kitchen, so it’d be great to make new recipes with them. We need some go to breakfast ideas and that blender is great. I would love to win to help with my healthy eating! We need help getting reset with our healthy eating. Our recipes have gone stale and we’re tired of doing all the online searches. A recipe book would do wonders for us. I’ve been making your pumpkin chocolate chip pancake recipe for years (in fact, I was the recipe tester. At the time, my youngest was 4 mo. old. He’s now 7). The blender would be fantastic because I roast, puree and freeze my Halloween pumpkins to use for the pancakes all year long. This blender would help tremendously! Love a Ninja for smoothies. Our favorite Breakfast at Christmas is Egg Casserole and Monkey Bread. My favorite breakfast is frittata made with spinach and feta cheese and I don’t even like eggs! A Ninja blender to prepare my frittata mixture would be a nice thing to have! I’d love to win the Ninja blender and Rise and Shine cookbook to help my family start each day off with a healthy meal. The smoothies sound like an easy way to blend vegetables into a delicious drink. Following on Pinterest, too 🙂 Great recipes! My blender is in rough shape and the cookbook looks amazing! I get my 4 y/o’s to eat their greens 4 days /week at breakfast by blending them puréed with grains and nut butters, but I need to expand their repertoire. My favorite breakfast recipe is peanut butter and banana pancakes. I’d love to win this because I’ve heard such good things about the Ninja blender. Love to make oatmeal ( Bob’s! Oats) in rice steamer and set up as buffet with toppings!! Love to win as we ALL love this meal! Love to make oatmeal ( Bob’s! Oats) in rice steamer and set up as buffet with toppings!! Love to win as we ALL love this meal and be great to have more recipes! I love cookbooks and this one would be a great resource for some healthier recipes to start my family’s morning…could use a new blender as well! I would LOVE the blender as my daughter just took a smoothie class with a local chef and she is hooked! We desperately need a blender upgrade. Not to mention the quest for better breakfasts. Breakfast is our favorite meal. We make your pumpkin pancakes a lot from No Whine with Dinner. These banana pancakes looks delicious and nutritious. The blender has been on my wish list for years. I’ve heard it’s life changing. We don’t usually make breakfast in the morning. But our family loves breakfast for dinner. Our favorite is Pumpkin Chocolate Chip Pancakes from No Whine With Dinner. Posted on FB the link to this blog post! Absolutely love moms kitchen handbook… Her pomegranate orange breakfast sundae is delicious and refreshing. Would love to give this cookbook to my college daughter. Shared it on Facebook too. I’d love to win the book to make some great new recipes, and I’d love to win the blender to make delicious smoothies. My favorite family recipe is cinnamon French toast! I’ve recently become the foster grandma of 2 kids here in Colorado who were raised in drug-infested households. Nutrition was definitely not the highest priority so we have some work to do to help them enjoy a variety of healthy foods. I would very much appreciate both the book and the blender to help me introduce them to a new – and better – food journey. Thank you in advance for your consideration. Happy holidays, everyone! I would love to win the cookbook and blender so my high school athlete children can prepare healthier breakfasts and snacks for themselves. I’d love to win this to make smoothies for my son! We love breakfast and could use new blender to up our game with smoothies. I would love to win the cookbook and blender so that I can incorporate new and exciting recipes for my family! My favorite breakfast toasted english muffins smothered in creamy peanut butter! Would love some inspiration for new healthy breakfast ideas for my kiddos! I really want to check out the recipes in this book! I’d love to win! Since we are a cereal family, we have a lot of room to improve our breakfast nutrition. Thanks so much! I would like to win because I could use some more breakfast ideas, I’m not very original for breakfast. It’s usually either eggs, toast french, cereal, etc. My favorite recipe is french toast with powered sugar and maple syrup. I love baked oatmeal! A favorite I have made multiple times is Betty Crocker Whole Grain Apple Baked Oatmeal, but I also have some recipe for Strawberry rhubarb and peach baked oatmeals that I love too!!! I would love to win because I need more ideas for breakfast. Our pediatrician just told me yesterday that my son needs to eat more protein and whole grain meals/snacks. This sounds perfect! I would love to win the blender and cookbook to give me some new ideas for protein packed breakfasts! I especially love fresh smoothies with Greek yogurt, frozen fruit, and green veggies to get my day started. Looking forward to trying many breakfast recipes anytime of the day. My son has an egg and nut allergy so I would love a podcast on protein options and egg substitutes for a toddler. Thanks!